It used to be that when I taught class and came to Gnosticism, eyes glazed over and clock-watching began. Mentioning Gnostics in church just never happened. The digital age of niche TV and “History Channel” documentaries has changed all that. The Gnostics are making prime time appearances and have agents. I get questions about them constantly. We are now in a period when it is not enough to know only about the Bible. The apologetics of the past is no longer adequate. Today's questions involve not only how the Bible came to be, but even if there was originally such a thing as orthodoxy. It is a crucial question. Christians need to know a lot more about the second century. Roots matter, especially in the founding of a movement. One question often raised is how there could be “orthodoxy” when there was no functioning New Testament until sometime between the late second and the fourth century. Doesn't this mean that Christianity could and did go in all directions until the canon nailed down doctrine? The claim is that our history is distorted because winners write the history. My reply is that in this case the winners deserved to win, because their faith had a theological rootedness that the Gnostics' did not. 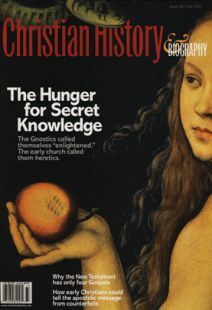 By tracing second-century theological discussion, we know that a connected use of New Testament books was not yet taking place. Though the individual books were circulating, the only functioning biblical “canon” was the Old Testament. So how was orthodoxy taught? Did it even exist? The simple answer is that the “Rule of Faith” was present. But how was the Rule of Faith passed on from generation to generation? Was there a mechanism that allowed church members to know what orthodoxy was? The answer is yes. It can be detected within our oldest historical sources for Christianity, showing that the roots of our faith's content go back to the earliest days of the faith. Three words summarize that mechanism: schooling, singing, and sacraments. Schooling involved doctrinal summaries. Much like memory verses today, they presented the core of the faith, not with the detail of the creeds that emerged after the Council of Nicaea, but with enough content to delineate the most central ideas about God, Jesus, and forgiveness through Jesus' death. 1 Corinthians 8:4-6, Romans 1:2-4, and 1 Corinthians 15:3-8 reveal this early church schooling. Singing involved hymns. Philippians 2:5-11 and Colossians 1:15-20 show how much theology was contained in what the earliest church sang. Sacraments involved the teaching presented at baptism and Communion. Here one can think of the words spoken over the Lord's Table (“On the night he was betrayed Jesus took the bread … This is for you”) or the picture of baptism summarized in Romans 6:2–4, which proclaims that Christ has put the old life to death and given new life. Here is orthodoxy, rooted in the acts of worship that took place each week before the New Testament canon appeared. The church could know its roots because the apostolic teaching showed up in worship. As a result, orthodoxy was passed on and Gnostic teaching was exposed as lacking the roots that mattered. Darrell L. Bock is research professor of New Testament studies at Dallas Theological Seminary.